In the previous article (http://ponnadi.blogspot.in/2012/11/archavathara-anubhavam-pillai-lokacharyar.html) we enjoyed piLLai lOkAchAryar's archAvathAra anubhavam. 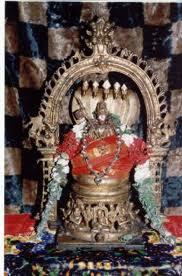 Let us now move on to see how azhagiya maNavALa perumAL nAyanAr enjoyed archAvathAra emperumAns. azhagiya maNavALa perumAL nAyanAr is the second son of vadakku thiruvIdhi piLLai and younger brother of piLLai lOkAchAryar. He was born by the divine mercy of srIranganAthan himself. For "tham chIr", he brings out one of the important glories of nAyanAr. He identifies that nAyanAr's expertise in aruLicheyal is far greater than all other AchAryas. This can be understood by studying AchArya hrudhayam which is fully built using the words from aruLicheyal (with some words from ithihAsa, purANams as well). When explaining "vaiya guruvin thambi", it is show that nAyanAr's greatness is due to him being born as the younger brother of piLLai lOkAchAryar. 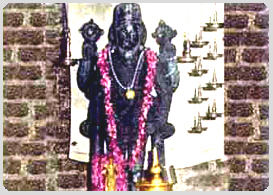 He is popularly glorified as "jagath guruvarAnuja" (brother of jagath guru piLLai lOkAchAryar). It is also explained that piLLai lOkAchAryar and nAyanAr lived in srirangam amidst great personalities like NampiLLai, periyavAchAn piLLai, vadakku thiruvIdhi piLLai, etc and these two brothers were blessed by all these great personalities. 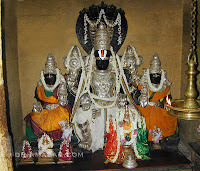 It is also explained based on nAyanAr's avathAra charithram that he is none other than srIranganAthan himself. Both piLLai lOkAchAryar and nAyanAr took the vow of naishtika brahmacharyam - that they will not get involved in gruhasthAshramam (married life) and lived by that vow. They both focussed on presenting the great hidden meanings for the benefit of everyone in this samsAram. 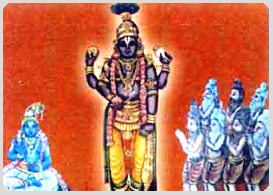 After nAyanAr ascending to paramapadham with all glories, who is present here to explain the rahasya thrayam - thirumanthram, dhvayam and charama slOkam (where emperumAn touched his heart and said "mAm" - I am the protector). Such is nAyanAr's glories that piLLai lOkAchAryar himself glorifies him. After piLLai lOkAchAryar compiling the great srIvachana bhUshaNa dhivya sAsthram, some in srirangam did not like the message presented in it. They came and complained to NamperumAL that it contains matters that are against sAsthram (specifically related to varNAshrama dharmam). NamperumAL wanting to hear the glories of this prabhandham from piLLai lOkAchArar himself, summons him to the sannidhi. At that time, piLLai lOkAchAryar had gone out for bathing, so nAyanAr arrives at the sannidhi. When NamperumAL asks nAyanAr about the particular issue, nAyanAr declares that srivachana bhUshaNa dhivya sAsthram is purely based on AzhwArs/AchAryas thiruvuLLam and it has nothing against the sAsthram. Immediately to prove that, he recites AchArya hrudhayam in front of thiruvaranganAthan. emperumAn after hearing it fully becomes greatly pleased and accepts the greatness of srIvachana bhUshaNam and AchArya hrudhayam. emperumAn drives away the people who complained to him and gives great honours to nAyanAr. 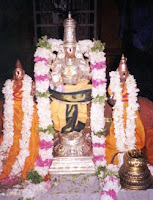 mAmunigaL in the vyAkyAna avathArikai for AchArya hrudhayam shows that AchArya means NammAzhwAr (who is the prathamAchArya for srivaishnavas) and hrudhayam means AzhwAr's thiruvuLLam (heart). He also says that nAyanAr has done this grantham by purely out of his mercy, using the words from aruLicheyal with in-depth meanings. Because of the usage of words from aruLicheyal and its in-depth meanings this grantham is most relishable from both shabdham (words) and artham (meanings) perspective for the ones who understand the real truth. mAmunigaL specifically identifies that this grantham is like "mukamaRiNthavan kOrththa muththu" (முகமறிந்தவன் கோர்த்த முத்து) meaning a necklace that is strung by one who exactly understands the pearls that are used - which means nAyanAr exactly knows the thiruvuLLam of AzhwAr and so was able to beautifully bring out the same using AzhwAr's words themselves. NammAzhwAr's glories and glories of his prabhandhams. svApadhEsa arthams for commonly used terms in aruLicheyal. AzhwAr sending messages to various manifestations (para, vyUha, vibhava, antharyAmi and archai) of emperumAn. 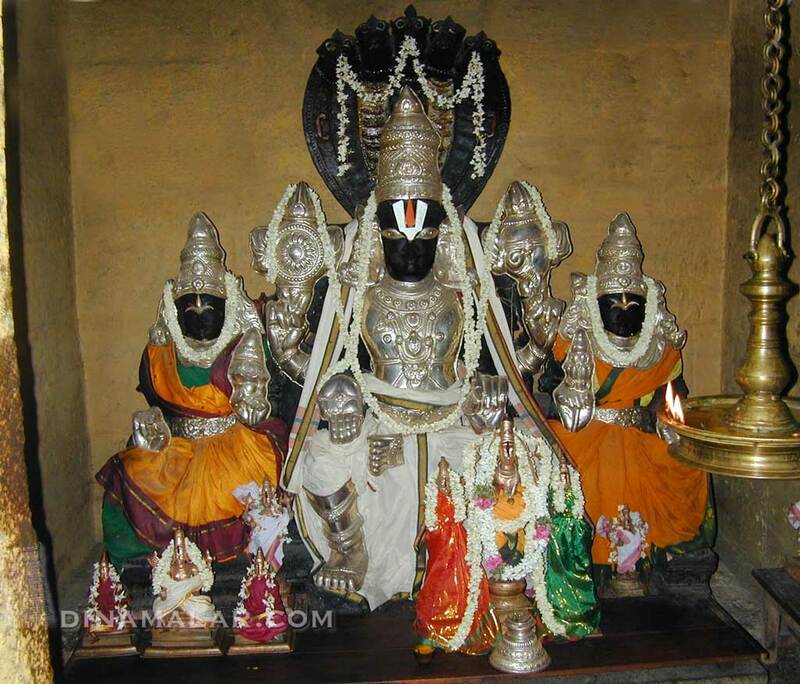 archAvathAra emperumAns who were glorified by NammAzhwAr and the qualities that shine in each of those emperumAns. NammAzhwAr's glories in comparison to others. 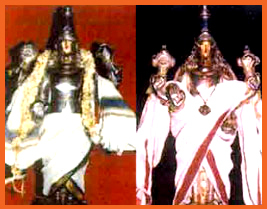 Comparison between bhagavath gIthai and thiruvAimozhi. 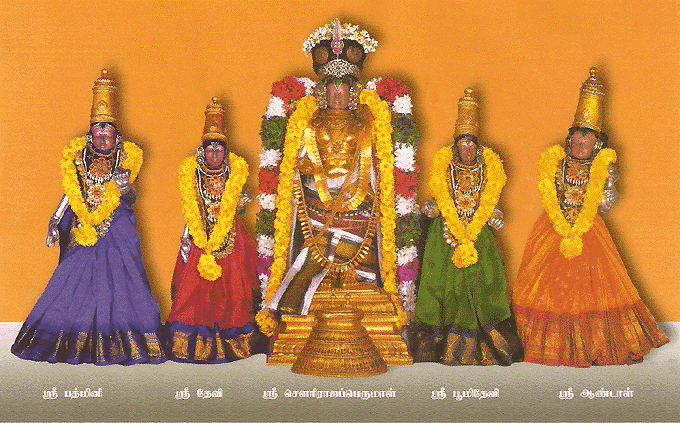 consolidation of each pathu (centum) of thiruvAimozhi. emperumAn's attachment towards AzhwAr and AzhwAr ascending to paramapadham. Of this, we will focus on nAyanAr's presentation of how AzhwAr enjoyed various dhivya dhEsa emperumAns. 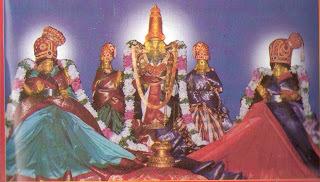 AzhwAr has performed mangaLAsAsanam for 30 dhivyadhEsa emperumAns in thiruvAimozhi. nAyanAr highlights that each emperumAn shows one particular guNam mainly to AzhwAr and AzhwAr ecstatically enjoys that particular guNam in his thiruvAimozhi. nAyanAr presents that AzhwAr sends thUthu (message) to various manifestations of emperumAn in chUrNikai 156. AzhwAr's thUthu is explained in a detailed manner in http://kaarimaaran.com/downoads/thoodhu.xls. In chUrNikai 157, nAyanAr shows the various manifestations using an example. He equates emperumAn to a king and explains just like the king has 5 different roles, emperumAn also takes up 5 different roles through his 5 different manifestations. This chUrNikai is already explained in http://ponnadi.blogspot.in/2012/10/archavathara-anubhavam-parathvadhi.html. In chUrNikai 158, nAyanAr starts bringing out the glories of archAvathAram. 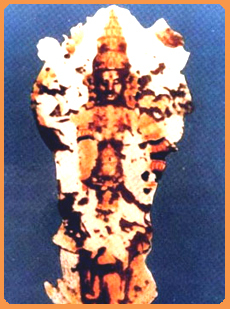 thamarugaNtha - the one where all the qualities are fully manifested and clearly visible. pinnAnAr vanNanGgumidam - the one who is there for the jIvAthmAs who are there after the completion of vibhavAvathArams. Right here we can see the beauty of nAyanAr's compilation purely using AzhwAr's words. 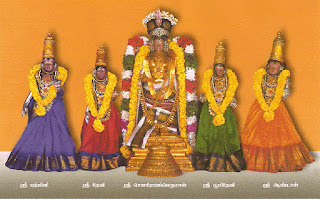 thamarugaNtha is from mudhal thiruvanthAdhi (44), adiyOmukkE is from periya thirumozhi (4.9.5), pinnAnAr vanNanGgum is from thirunedunthANdakam (10) and pUrNam is from upanishads. After this, nAyanAr starts glorifying each emperumAn as sung by AzhwAr. He shows that AzhwAr enjoyed one particular quality in each of those emperumAns which outshone the other qualities (all qualities exist in all archAvathAra emperumAns, AzhwAr was attracted by one particular quality in each emperumAn). mAmunigaL beautifully explains that since thiruvarangam is the main dhivadhEsam nAyanAr starts with thiruvaranganAthan. 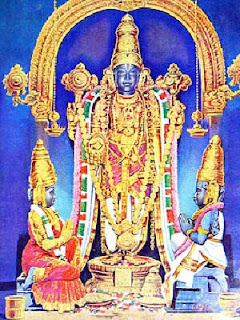 Since nAyanAr started with thiruvarangam first where he sees vyUhva vAsudhEvan, he continues on to thirumalai (where he sees antharyAmi emperumAn's qualities) and AzhwAr thirungari (where he sees parathvam in archAvathAram). After that he goes on with the actual sequence of AzhwAr's thiruvAimozhi padhigams until the end. Even though thirumAlirunchOlai azhagar is glorified in a whole padhigam before thiruvEnkatamudaiyAn, mAmunigaL shows that since azhagar is glorified again in the end, nAyanAr explains azhagar's glories in that sequence towards the end. Let us now start enjoying each archAvathAra emperumAn as shown by nAyanAr and mAmunigaL (in his vyAkyAnam). Note: It is very difficult to translate the chUrNikais directly. We can only try to present the essence of the chUrNikai. 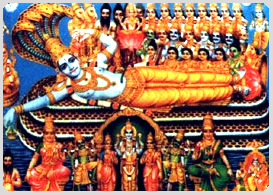 In srirangam, where sriya:pathi emperumAn is lying down beautifully to uplift jIvAthmAs of bhUlOkam to brahmalOkam. As seen in kangulum pagalum, AzhwAr (in mother bhAvam) is asking emperumAn to bless parAngusa nAyaki and enquires him how he is going to do that. AzhwAr also says emperumAn is vadivudai vAnOr thalaivan (வடிவுடை வானோர் தலைவன்), kadalidam konNda kadalvanNnNA (கடலிடம் கொண்ட கடல்வண்ணா), katkilI (கட்கிலீ), etc which relates to kshIrAbdhinAthan who has descended to samsAram purely to uplift all the jIvAthmAs. From this, we can understand that the main guNam enjoyed by AzhwAr in thiruvarangam is vyUha sauhArdham (kind hearted nature). thiruvEnkatam is explained as the prApyam (goal) for both nithya sUris and samsAris. mAmunigaL quotes "kanNnNAvAnenRum manNnNOR vinNnNOrkku" (கண்ணாவானென்றும் மண்ணோற் விண்ணோர்க்கு) where emperumAn is said as the controller of ubhaya vibhUthi. because of his relationship with all jIvAthmAs he has unbounded affection over everyone which is explained by AzhwAr himself in "en kanN pAcham vaiththa paranYchudar chOthi" (என் கண் பாசம் வைத்த பரஞ்சுடர் சோதி) - i.e., after showing mercy to AzhwAr emperumAn's glories became much greater. 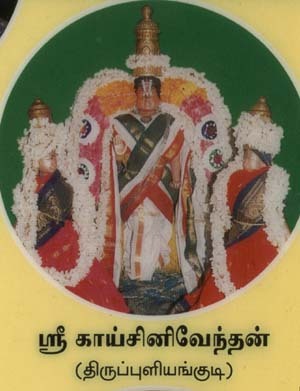 AzhwAr also glorifies emperumAn's vAthsalyam in "agalagillEn" (அகலகில்லேன்) pAsuram as "Nigaril pugazhAy" (நிகரில் புகழாய்). Here pugazh means glory and nigaril pugazh means unmatched glory - this vAthsalyam - motherly love of emperumAn cannot be shown by anyone else. 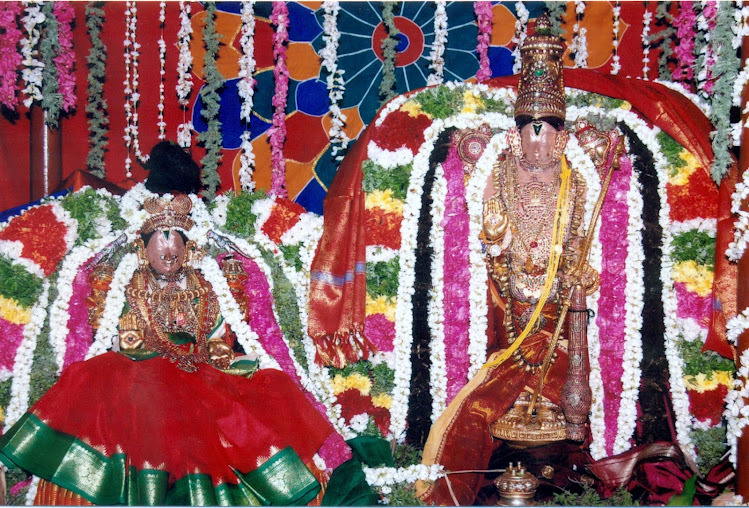 Thus, emperumAn's vAthsalyam (motherly forbearance) is enjoyed by AzhwAr in thiruvEnkatam. 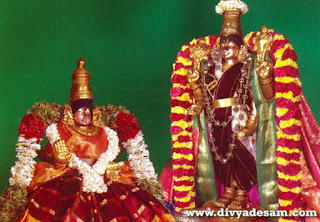 vAthsalyam is also one of the important qualities of antharyAmi emperumAn, since he stays in everyone's heart out of pure love and guides them like a mother. So, here, emperumAn's antharyAmithvam is also enjoyed by AzhwAr. 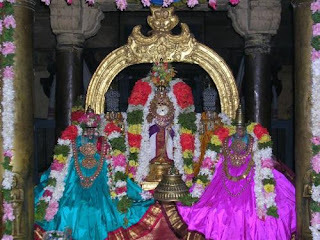 Like praNavam which has importance for both paramAthmA (akAram) and jIvAthmA (makAram), thirukkurugUr temple has importance for both AthinAthan emperumAn and AzhwAr. Here, AzhwAr enjoys emperumAn's parathvam. mAmunigaL quotes "eththEvum evvulaganGgaLum maRRum thanpAl maRuvil mUrththiyOdoththu iththanaiyum NinRa vanNnNam NiRkavE" (எத்தேவும் எவ்வுலகங்களும் மற்றும் தன்பால் மறுவில் மூர்த்தியோடொத்து இத்தனையும் நின்ற வண்ணம் நிற்கவே) - All the chEthanams and achEthanams are sharIram to him and such emperumAn is situated firmly in thirukkurugUr. So, here, emperumAn's parathvam (supremacy) is enjoyed by AzhwAr. mAmunigaL explains that nAyanAr uses "vaishnava vAmanam" since thirukkurungudi nambi took a humble position in front of emperumAn to become srivaishnava nambi just like he went for bikshai infront of mahAbali. Another reason he quotes is, in the end of this padhigam, AzhwAr says "aRiyak kaRRu vallAr vaishnNavar" (அறியக் கற்று வல்லார் வைஷ்ணவர்) - one who learns this padhigam and puts this knowledge in practice is a vaishnavan and this place is popularly known as vAmana kshEthram - so a combination of those two becomes "vaishnava vAmanam". AzhwAr says "Neela mEniyum NAngu thOLum en NenYcham NiRaiNthanavE" (நீல மேனியும் நான்கு தோளும் என் நெஞ்சம் நிறைந்தனவே) meaning his heart is filled with the beautiful bluish form and his four strong shoulders. Here, AzhwAr enjoys emperumAn's lAvanNyam (full beauty) of emperumAn. 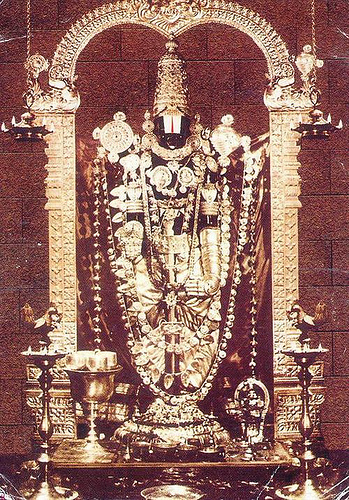 AzhwAr also enjoys vibhavAvathAram (vAmanavathAram) here. For the one who develops the taste based on seeing the beauty of emperumAn, dheivanAyakan emperumnAn shows his lotus feet as the upAyam out of his audhAryam (pure generosity). mAmunigaL shows "ARenakku Nin pAdhamE charanNagath thaNthozhiNthAy" (ஆறெனக்கு நின் பாதமே சரணகத் தந்தொழிந்தாய்) meaning emperumAn shows his lotus feet as the upAyam for AzhwAr. He also shows "vaNdharuLi ..." (வந்தருளி) which means emperumAn descended here as archAvathAram to accept AzhwAr instead of AzhwAr approaching emperumAn. 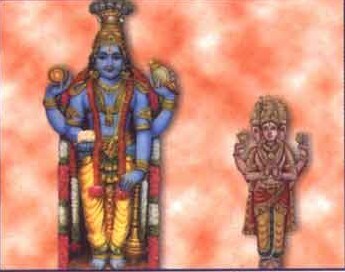 Also, it is shown that vandhu is upEyam (emperumAn's presence is the goal) and aruLi is upAyam (his grace is the means to get him). With this, in the first five dhivya dhEsams, in addition to one specific guNam, AzhwAr also enjoys the five different types of manifestations viz vyUham, antharyAmi, param, vibhavam, archai (in sequence of the anubhavam). In thirukkudanthai, ArAvamuthan emperumAn's mAdhuryam (sweet nature) which melts the heart of the ones who are completely surrendered to him flows. mAmunigaL quotes that AzhwAr said "kaLaivAy thunbham kaLaiyAthozhivAy kaLaikanN maRRilEn" (களைவாய் துன்பம் களையாதொழிவாய் களைகண் மற்றிலேன்) meaning "whether remove my sorrows or not, I have no other go" showing his ananya gathithvam. emperumAn revealed his sweet nature to him which melts AzhwAr as shown by him in "NIrAy alaiNthu urukkuginRa NedumAlE" (நீராய் அலைந்து உருக்குகின்ற நெடுமாலே). When AzhwAr's heart melts for kOlappirAn emperumAn and when such emperumAn is not immediately seen and enjoyed, AzhwAr becomes worried. At this time, emperumAn's mercy comforts AzhwAr and develops his faith in emperuAn's quick arrival. mAmunigaL aptly quotes "adimEl chEmam koL thenkurugUrchchatagOpan" (அடிமேல் சேமம் கொள் தென்குருகூர்ச்சடகோபன்) and "perumAnathu thollaruLE" (பெருமானது தொல்லருளே) meaning AzhwAr is comforted by emperumAn's krupai (mercy). For the faithful ones, pAmbaNai appan emperumAn's protection is stabilized in their minds by looking at thirvaNvaNdUr emperumAn who is on the banks of pampai river. In this padhigam, AzhwAr enjoys emperumAn as srIrAman who says "Na thyajEyam" (I wont give up), "Ethath vratham mama" (This is my vow). mAmunigaL also brings up "ERu chEvakanArkku ennaiyum uLaL enmingaLE" (ஏறு சேவகனார்க்கு என்னையும் உளள் என்மின்களே) meaning AzhwAr sends a messenger to emperumAn to tell him that there is still one person left to be protected and unless he protects him, his quality of rakshakathvam cannot be fulfilled. Here AzhwAr enjoys the sthairyam (stability) of emperumAn. When AzhwAr showed his dissent to thiruviNNagar appan emperumAn in minnidai madavArgaL padhigam (6.2) and did not accept him for arriving late, emperumAn shows in this padhigam that he is able to bring contradictory features together and tells AzhwAr that he will change AzhwAr's mind as well which is not accepting emperumAn at the moment. mAmunigaL quotes "pOgu NambI" (போகு நம்பீ), etc., where parAngusa nAyaki asks kaNNan emperumAn to leave and then AzhwAr seeing "Nalkuravum chelvum" (நல்குரவும் செல்வும்) where emperumAn controls everything and this is highlighted in "thiruvinNnNagar NannagarE" (திருவிண்ணகர் நன்னகரே) meaning the good place named thiruviNNagar. Thus AzhwAr enjoys virudhdhagataNa sAmarthyam (ability to bring conradictory features together) of emperumAn here. Here AzhwAr enjoys emperumAn's bhAndhathvam (eternal relationship) with parAngusa nAyaki which makes her friend tell her mother to give up any attachment towards her. This dhivya dhEsam emperumAn has special relationship with AzhwAr since AzhwAr declares "dhEvapirAnaiyE thaNthai thAy" (தேவபிரானையே தந்தை தாய்), dhEvapirAn is only my father and mother. 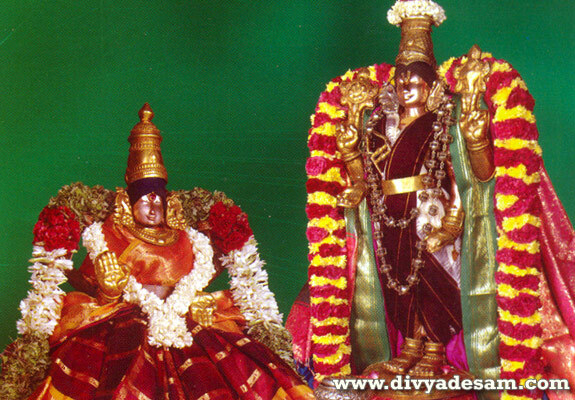 Also it is said "dhviguNam" here because the joy is doubled in this dhivya dhEsam due to the presence of dhEvapirAn and aravindha lOchanan emperumAns. As AzhwAr's mother worries for parAngusa nAyaki for having lost everything for emperumAn in mAlukku padhigam (6.6), emperumAn shows himself as "vaiththa mANidhi" (வைத்த மாநிதி), a huge treasure, AzhwAr enjoys emperumAn here as thAraka, bhOshaka and bhOgyam (sustaining, nourishing and enjoying), emperumAn's Apathsakthvam (helping the needy) is enjoyed by AzhwAr here. This dhivyadhEsam is called "pugumUr" by AzhwAr. Once ananthAzhwAn meets a srivaishnava in a village. 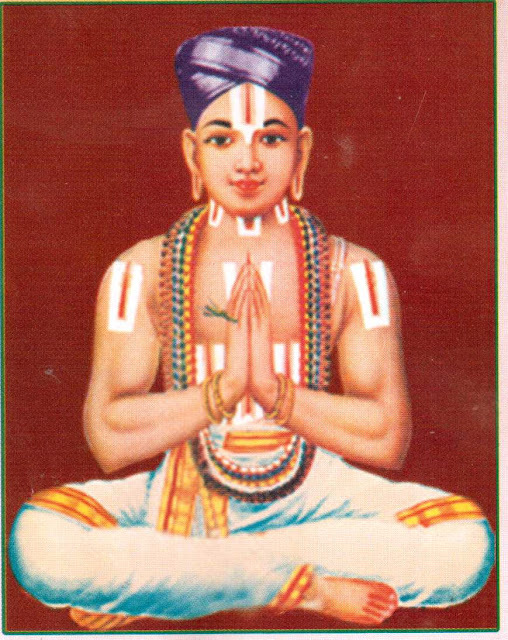 He asks where he is from and that srivaishnava says he is from thirukkOLur. When asked why he was here in this village leaving behind thirukkOLur, he says he came here looking for livelihood. For that ananthAzhwAn says, thirukkOLur is the place where everyone should enter, but you have left that place - you could have even had a couple of donkeys and made some livelihood of them right there instead of leaving that dhivyadhEsam. When AzhwAr rushes to see emperumAn unable to wait for him, emperumAn's saundharyam (beauty) first pulls AzhwAr's closest aide, that is his heart, towards him. AzhwAr himself says, "if emperumAn takes away my heart what can I do now". 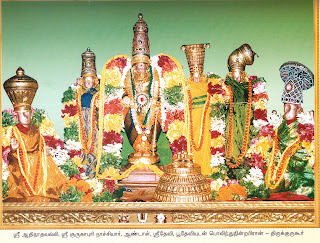 makara nedum kuzhai kAthan emperumAn's beauty is explained by AzhwAr as "chenGkanivAyin thiRaththathAyum" (செங்கனிவாயின் திறத்ததாயும்), etc. Here "mAnagar" means the great place where emperumAn's adiyArs are so ecstatic and constantly reciting sAma vEdham. When emperumAn comes with his mahishis to stay in thiruvAranviLai to listen to AzhwAr's pAsurams, AzhwAr's attachment towards thirukkuraLappan emperumAn increases too much and makes him simply give up parampadham as well. AzhwAr himself says "chiNthai maRRin thiRaththathallAth thanmai" (சிந்தை மற்றின் திறத்ததல்லாத் தன்மை), that my mind is fully situated in thirukkuraLappan and no one else. Thus emperumAn's Anandha vruththi (blissful activity) is enjoyed by AzhwAr here. mAyakkUthan emperumAn shows his divine activities to AzhwAr who is fully attached to him. By showing his divine activities (such as vAmana-thrivikrama charithram), he removes the lajjai (shyness), etc of AzhwAr. Thus AzhwAr enjoys emperumAn's Accharya chEshtitham (marvellous activities) here. AzhwAr looking at thiruvAzhmArbhan emperumAn's saukumAryam (delicate nature) starts worrying for him who has descended to samsAram which is full of calamities leaving behind paramapadham which is full of joy. 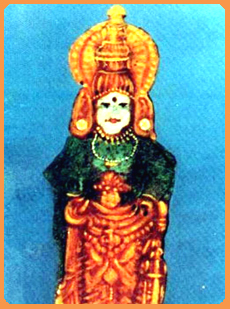 mAmunigaL shows that nAyanAr uses the term "AychchEri" since it is the birth place of udaiyanangai who is the mother of NammAzhwAr (Ay - mother, chEri - place). 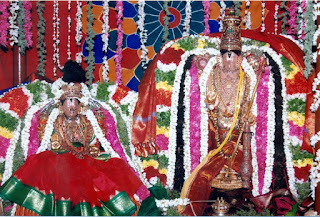 This padhigam is called NammAzhwAr's thiruppallANdu, where AzhwAr is performing mangaLAsAsanam for emperumAn. Like vidhura who is called mahAmadhi for his extreme attachment to kaNNan emperumAn, AzhwAr who is fearing for emperumAn's well being and emperumAn immediately shows his sauryam (bravery), where he defeated kuvalayApItam, the wrestlers and finally kamsan as well very easily. 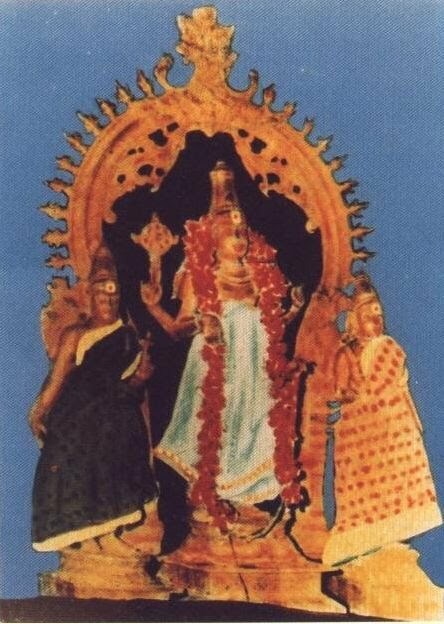 AzhwAr identifies that this emperumAn is imayavarappan - one who is the leader of all nithya sUris and also he is the controller of all dhEvathais in this world. aRputha NArAyaNan emperumAn's main goal is to capture AzhwAr's heart. But to achieve that he first arrives at thirukkadithAnam. AzhwAr seeing emperumAn at thirukkadithAnam gives his heart to him and says "thirukkadiththAnamum ennudaich chiNthaiyum orukkaduththuLLE uRaiyum pirAn" (திருக்கடித்தானமும் என்னுடைச் சிந்தையும் ஒருக்கடுத்துள்ளே உறையும் பிரான்). But even after capturing AzhwAr's heart, emperumAn does not give up his residence in thirukkadithAnam since he wants to show his kruthjnYathai (gratitude) to the dhivyadhEsam which brought AzhwAr to him. piLLai lOkAchAryar also highlights the same point in srIvachana bhUshaNam in "iLam kOyil kaividEl" (இளம் கோயில் கைவிடேல்), emperumAn will not give up his dhivyadhEsams even after achieving his goal. AzhwAr calls this place "thAyappathi" indicating there is paternal relationship here. emperumAn is the only husband to all jIvAthmAs. AzhwAr says "appan thiruvaruL mUzhginaL" (அப்பன் திருவருள் மூழ்கினள்) meaning he plunged in to the ocean of mercy of the emperumAn. Once AzhwAr did that, mAyappirAn emperumAn reveals him all the bodily beauty and the beauty of the ornaments that decorate him - these two are part of the completeness of a husband. Once AzhwAr saw that he became completely subservient to emperumAn. It is the nature of jIvAthmA to be completely subservient to emperumAn and not to look at any one else. AzhwAr enjoys this NAyaka lakshaNam (husbandness/manliness) in mAyappirAn emperumAn. emperumAn is showing his urgency to enjoy AzhwAr who's love is increasing towards emperumAn in thiruppuLingudi, thiruvaraguNAmangai and srIvaikutam dhivya dhEsams. But emperumAn is unable to wait for that love to reach its peak. Just like if some one is hungry, first he will be lying down in the hall, then he will start sitting in the dining room and finally he will come closer to the kitchen and stand in the entrance looking out for the food, mAmunigaL quotes "puLinGkudikkidaNthu varagunNamanGgaiyiruNthu vaikuNthaththuL NinRu" (புளிங்குடிக்கிடந்து வரகுணமங்கையிருந்து வைகுந்தத்துள் நின்று) meaning emperumAn is lying down in thiruppuLingudi as kAisini vEndhan, he is sitting in thiruvaraguNamangai as vijayAsanan and his standing in srIvaikuntam as mAyappirAn. 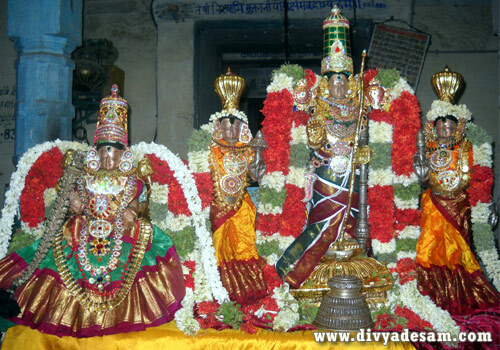 Thus AzhwAr is enjoying emperumAn's bhOgya pAga thvarai (urgency to enjoy AzhwAr after AzhwAr developing parama bhakthi) in these three dhivyadhEsams. When AzhwAr's manifests such paramabhakthi, thirukkAtkarai appan emperumAn's anubhavam with AzhwAr leads to emperumAn giving up his sEshithvam (lordship) to AzhwAr and him becoming subservient to AzhwAr. mAmunigaL quotes "vArikkonNdu" (வாரிக்கொண்டு) pAsuram where AzhwAr says he wanted to enjoy emperumAn, but emperumAn had so much more desire to enjoy AzhwAr, that he enjoyed him even before AzhwAr can do that. Thus, AzhwAr enjoys emperumAn's sauseelyam (magnanimity) in this dhivyadhEsam. thirumUzhikaLaththAn emperumAn is so tender hearted that he cannot bear to see the sorrow of the great devotees of him who cannot bear his separation. mAmunigaL quotes ALavandhAr's sthOthram "mahAthmabhir mAmavalOkyathAm Naya kshanNEpi thE yathvirahOthidhussaha:" (மஹாத்மபிர் மாமவலோக்யதாம் நய க்ஷணேபி தே யத்விரஹோதிதுஸ்ஸஹ:) - those mahAthmAs who consider just seeing emperumAn's vigraham (thirumEni) once is better than mukthi itself, cannot bear the separation from emperumAn even for a second. Thus AzhwAr enjoys emperumAn's mArdhavam (tender hearted nature) here. For the ones who are suffering in the ocean of vislEsham (separation) which is this samsAram, NArAyaNan emperumAn becomes the ship out of compassion which helps them cross this samsAram. mAmunigaL quotes "vishnNu pOtham viNA NANyath kinYchithasthi parAyanNam" (விஷ்ணு போதம் விநா நாந்யத் கிஞ்சிதஸ்தி பராயணம்) meaning only emperumAn can be the ship to cross this ocean of samsAram. mAmunigaL also quotes "NAvAyuRaiginRa" (நாவாயுறைகின்ற) meaning emperumAn is firmly situated in thirunAvAy to uplift the jIvAthmAs especially the ones who are surrendered to him. Thus, AzhwAr enjoys emperumAn's Anrusamsyam (compassion) here. sourirAjan emperumAn guarantees to AzhwAr that AzhwAr will reach paramapadham as soon as he gives up his thirumEni. mukundhan means one who can grant mOksham. 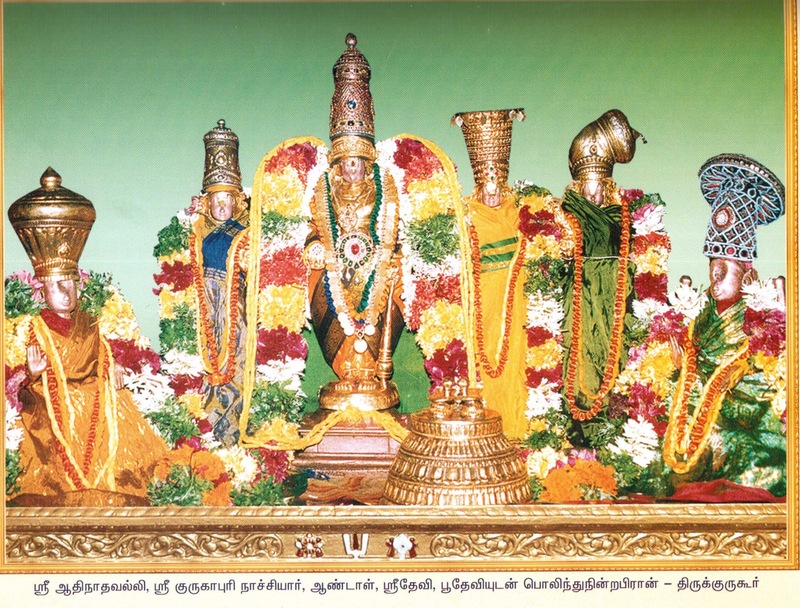 uthpalAvathagam is the name of the vimAnam in thirukkaNNapuram. And AzhwAr says "charanNamAgum thana thAL adaiNthArkkellAm maranNamAnAl vaikuNtham kodukkum pirAn" (சரணமாகும் தன தாள் அடைந்தார்க்கெல்லாம் மரணமானால் வைகுந்தம் கொடுக்கும் பிரான்), for the ones who surrenders unto the lotus feet of emperumAn, he will give them mOksham as soon as they give up their body. Thus AzhwAr enjoys emperumAn's mOksha prathathvam (ability to give mOksham) here. For the ones who are going to paramapadham, thirumOgur Apthan emperumAn, accompanies them with his cool nature enroute to paramapadham. Apthan means wellwisher - emperumAn being our best well-wisher, even accompanies us in our journey to paramapadham. AzhwAr explains him as "kALamEgam" (காளமேகம்) meaning cool as cloud and "marathaga manNith thadam" (மரதக மணித் தடம்) meaning a cool pond. This dhivya dhEsam is named after emperumAn who took mOhini avathAram. Such cool nature of emperumAn is required for the jIvAthmA to relieve himself of all the hardships he went through in the samsAram. Thus AzhwAr enjoys emperumAn's chaithyam (coolness) here. ananthasayanan emperumAn shows his head, navel and lotus feet via three entrances for accepting worship from nithyasUris (his divine sEnai), dhEvas (his son brahmA, etc) and prapannas (his sishyas). mAmunigaL brings out "amararkOn archchikkinRu anGgu agappanNi cheyvar vinNnNOr" (அமரர்கோன் அர்ச்சிக்கின்று அங்கு அகப்பணி செய்வர் விண்ணோர்) which identifies nithyasUris like sEnai mudhaliAr who performs confidential services to emperumAn, "amararAyth thiriginRArgatku" (அமரராய்த் திரிகின்றார்கட்கு) which identifies brahmA, etc who runs around and looks after themselves and "padamudaiyaravil paLLipayinRavan pAdham kAnNa NadaminO NamargaLuLLIr" (படமுடையரவில் பள்ளிபயின்றவன் பாதம் காண நடமினோ நமர்களுள்ளீர்) which identifies the prapannas who go to take the dharshan of emperumAn's divine feet. We can recollect how ALavandhAr immediately left srIrangam after hearing this pAsuram during arayar sEvai to perform mangaLAsAsanam to anantha sayanan emperumAn. Thus, AzhwAr enjoys emperumAn's sAmyam (equality) towards all types of jIvAthmAs here. Adhi kEsavan emperumAn follows the heart of his adiyArs while giving them mOksham. mAmunigaL quotes "aruL tharuvAn amaiginRAn athu Namathu vidhi vagaiyE" (அருள் தருவான் அமைகின்றான் அது நமது விதி வகையே) which means emperumAn gives mOksham as commanded by his devotee. Thus AzhwAr enjoys emperumAn's Ashritha pArathanthriyam (subservience to his devotees) here. azhagar emperumAn is bewildered in looking at AzhwAr's thirumEni just like a prince will like his wife's remanants. 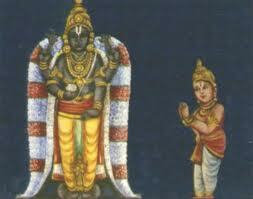 Here dhEham is shown as thyAjya dhEham which means the body that should be given up. But in AzhwAr's case, it is thirumEni where ultimate devotion towards emperumAn grew, so emperumAn considers AzhwAr's thirumEni similar to dhivya dhEsams like thirumAlirunchOlai malai, thiruvEnkatam, paramapadham which are very dear to him. Also, emperumAn who clears everyone's ignorance himself becomes bewildered looking at AzhwAr. So, AzhwAr now turns around and instructs emperumAn that this thirumEni should be given up by saying "manGgavottu un mAmAyai" (மங்கவொட்டு உன் மாமாயை), achith is your own property but you have to give it up in the samsAram and just carry me (the jIvAthmA) to paramapadham. Thus AzhwAr enjoys emperumAn's vyAmOham (bewilderment) here. appak kudaththAn emperumAn is looking for some good quality in jIvAthmAs to acknowledge them and establish his svAmithvam (that he is the propreitor of every one and everything). AzhwAr says "thirumAlirunYchOlai malai enREn enna thirumAl vaNthu en NenYchu NiRaiyap puguNthAn" (திருமாலிருஞ்சோலை மலை என்றேன் என்ன திருமால் வந்து என் நெஞ்சு நிறையப் புகுந்தான்), as soon as I said thirumAlirunchOlai malai, emperumAn entered my heart and established himself fully there. The same concept is explained by piLLai lOkAchAryar as emperumAn uplifting jIvAthmAs based on "en Uraich chonnAy, en pEraich chonnAy, etc" (என் ஊரைச் சொன்னாய், என் பேரைச் சொன்னாய், etc) meaning you recited the name of the dhivya dhEsam I reside, you recited my name, etc. Thus AzhwAr enjoys emperumAn's svAmithvam (propreitorship) here. Finally, nAyanAr shows the great importance of gruhArchai in chUrNikai 75. After all, one must truly appreciate emperumAn's extreme saulabhyam of entering our own homes without any hesitation and accepting direct kainkaryam from every one of us. This chUrNikai is actually presented by nAyanAr to show that one must not disrespect AzhwAr based on his birth. He is citing gruhArchai as an example to establish his point. 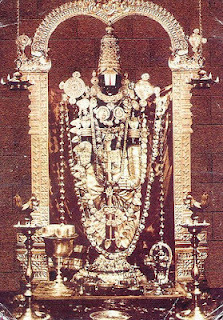 vIttinba inbappAkkaLil dhravyabAshA NirUpanNa samam inbamAriyilArAychchi. (வீட்டின்ப இன்பப்பாக்களில் த்ரவ்யபாஷா நிரூபண ஸமம் இன்பமாரியிலாராய்ச்சி). 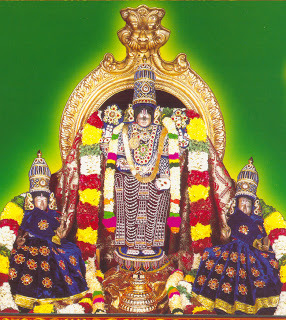 Disrespecting AzhwAr based on his birth is as bad as judging the archAvathAra emperumAn (who has arrived to our home to give happiness to us) based on the rawmaterial his thirumEni is made of and disrespecting aruLicheyal (which is so relishable to great AchAryas) based on the language it is sung. mAmunigaL takes many pramANams from sAsthram which explains that only fools will engage in these acts of disrespecting AzhwAr based on his birth, etc. We have seen a little bit from nAyanAr's archAvathAra anubhavam in AchArya hrudhayam. 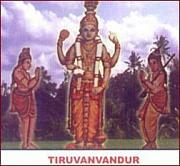 This grantham is the best research work done on thiruvAimozhi, analysing various aspects in detail. Without mAmunigaL's vyAkyAnam we cannot understand even a little bit in this. nAyanAr has also done vyAkyAnams as we have seen before. If we start going into his vyAkyAnams, there is so much relishable topics in them. 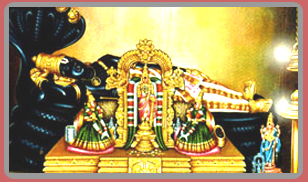 His vyAkyAnams to aruLicheyal are very elaborate and very exquisite with in-depth meanings. Let us pray at his lotus feet so that we can also develop some attachment towards our AzhwArs and AchAryas. 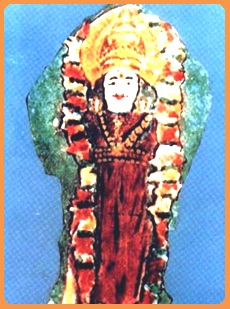 In the next article we will see vEdhAnthAchAryar's archAvathAra anubhavam. Beautiful. Thanks Swamin.. Hope you can do translation of Acharya Hrudayam in full. thanks for the feedback. thats a huge task. but if that is emperumAn's thiruvuLLam it will happen someday.